Part time self-employment grew by 88% between 2001 and 2015, compared to 25% for the full-time mode. The IWW has always actively engaged with all sectors of the work class and the establishment of this group is the latest step of our work amongst the unwaged. These three words have long summarised the Wobbly (a slang name for the IWW) approach to what the working class do to oppose capitalism. 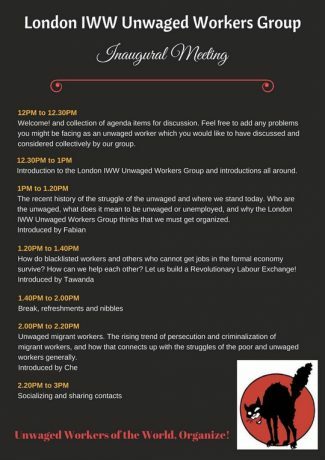 Our Unwaged Workers Group is currently working on a Workers’ School, based on precisely these concepts. It would be great to see you at the meeting and hear your ideas on how we could take this exciting idea forward.